Normal quantity discounts do not apply to our line of IsoDoors. All other products purchased with an IsoDoor will be discounted accordingly. A purchase of multiple IsoDoors can result in discounts up to 5%, depending on quantity. These discounts automatically apply when the doors are added to your cart. Change Width From Standard 36"
View our Product FAQ for answers to common questions about our line of IsoDoors. Our proprietary and fully sound tested IsoDoor HD is created for walls that require the highest levels of performance within a single operating wood door. The IsoDoor HD is well suited for any wall with an STC rating of 64 or lower. The IsoDoor HD is most commonly used in home theaters, recording studios, and rooms that require exceptionally high isolation for both low frequencies and within the vocal range. The standard size for our IsoDoor HD is 36" wide and 80" tall. The slab thickness is 2-1/2" with a standard backset of 2-3/4". We recommend the use of either an Emtek or Baldwin handle for the IsoDoor HD to fit the extra slab depth. The weight of the IsoDoor HD is 335 pounds, about 235 pounds more than a solid core noise cancelling door, and even 105 pounds more than our standard sound deadening interior door. Each IsoDoor HD arrives pre-hung with a jamb to match your wall depth, up to 10" included in the price (deeper jamb depths available on request). All perimeter seals are included with a fully mortised automatic door bottom, acoustic threshold, and rubber perimeter seal system. The HD LF core increases low frequency performance significantly while sacrificing some performance in the mid to high frequency range. This change in core type is provided at no extra cost. Communicating assemblies are best when each noise cancelling door slab is different. Using an IsoDoor HD and IsoDoor HD LF is a great combination that will easily keep up with the highest performing walls built. Our line of IsoDoors are designed and manufactured from start to finish by IsoStore. We offer a full year warranty on workmanship and materials from the date the noise cancelling door is received. Measure or calculate the depth of the wall from the two outside finish layers (include all layers of drywall and isolation products). Our standard door price allows for extra wide jambs up to 12". Custom jambs are available for depths greater than 12". If communicating doors are planned, measure the overall depth of the cavity where the doors will be installed, divide by two, and subtract 1/4" from each jamb depth. This 1/2" gap is used to relieve air pressure into the wall cavity when closing both doors. Our standard door price is based on a 36" door width for a 38" rough opening. An option to change the width to 30", 32", 34", and 42" is available. Other custom widths are available upon request. Our standard door price is based on an 80" door height for an 82" rough opening. An option to change the height to 84" or 96" is available. Other custom heights are available upon request. We now offer one-sided panel designs to match your aesthetic requirements without sacrificing performance. This option is available in both paint or stain grade. The side with the panel design is defaulted to the outside of the room (based on door swing selected) unless noted otherwise during ordering. Installation of our doors require at least two people. The steps involved with installing a sound door are very similar to installing a standard door. Careful attention must be paid to the rubber perimeter seals and adjustment of the automatic door bottom to achieve the full STC ratings achieved in our lab testing. Each IsoDoor HD will ship with a full installation guide and receiving instructions. 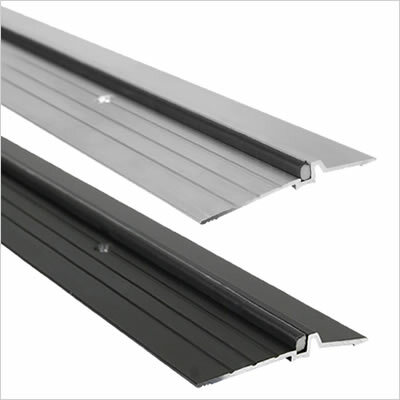 Our door seals create dead air space and redundancies allowing for an easy installation with more room for error. Because of this, performance from our lab tests are easily replicable in the field. 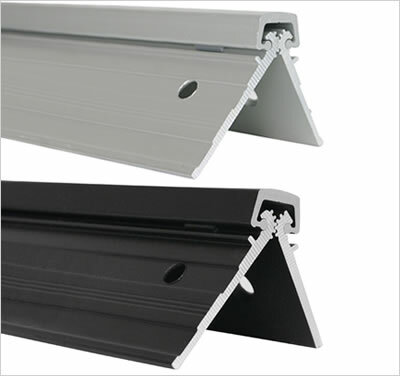 Other isolation door manufacturers have bulky seals that appear to install easily, but often create major deficincies in the corners and will require adjustment over time. 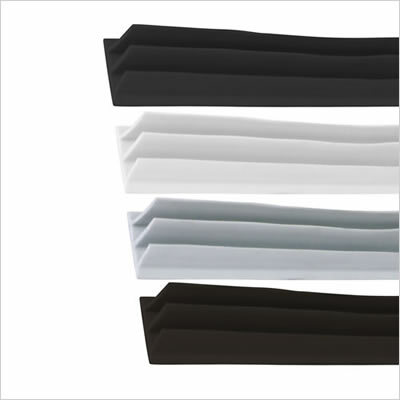 Dimensions Standard 36" x 80" or 32" x 80"
Slab Panel Standard is Smooth. 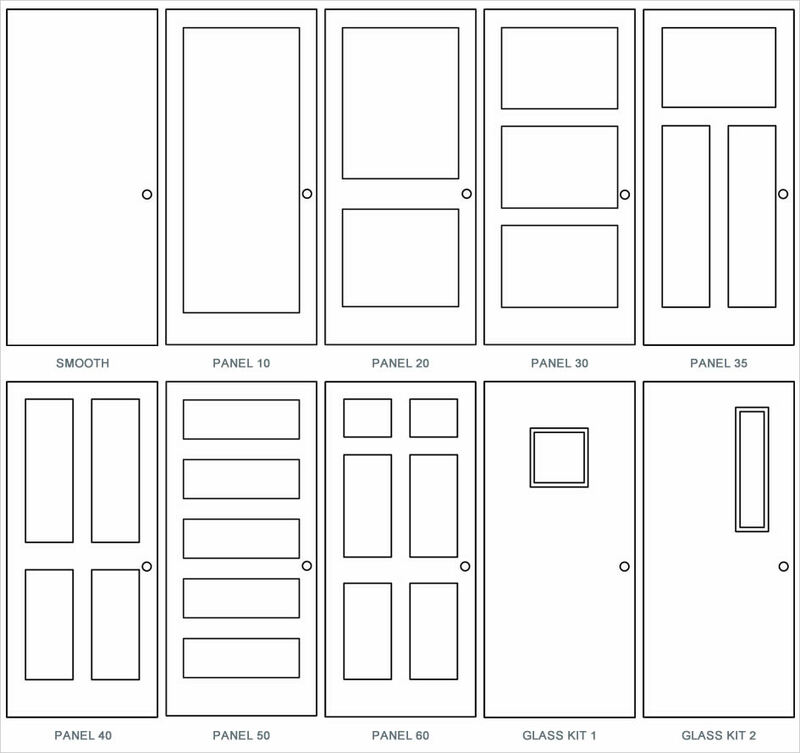 Options for Panel 10, 20, 30, 40, 50, and 60. The IsoDoor HD was sound tested most recently in 2012 as an operable individual door at the most accurate acoustics lab in the United States using the most recent ASTM standards. The results of the operable individual door tests can be found in the product specs download. We have also completed independent sound tests of communicating assemblies using our IsoDoor HD with our IsoDoor S and IsoDoor Basic. The results for some of these tests can be found below. Others are available upon request. Unfortunately, the accuracy and consistency of STC tests varies greatly depending on the lab and the year testing was completed. The majority of testing we have found is no more recent than the mid-1990′s with some testing back to the 1960's. To make it worse, many of the tests were done in the manufacturer's own facilities in labs that cannot accurately measure the ranges tested. We suggest creating a communicating door assembly to increase isolation significantly beyond the IsoDoor HD. Our tests show STC/OITC ratings with the IsoDoor HD as high as 65/50 which meets or exceeds double stud walls. Combining the IsoDoor S with the IsoDoor HD or combining the IsoDoor HD with the IsoDoor HD LF will help avoid common resonance issues that occur when two similar materials are installed in the same assembly. *All test results shown in this table were achieved through third party testing from accredited laboratories. The full test is available upon request.